--Robert Allen, author of the New York Times bestsellers Nothing Down, Creating Wealth, Multiple Streams of Income and The One Minute Millionaire. "Change happens. It's natural. It's ever present. It's reoccurring. So when markets shift you need to as well. No one explains this better in the real estate industry than my good friend Gary Keller and his team of talented co-authors. 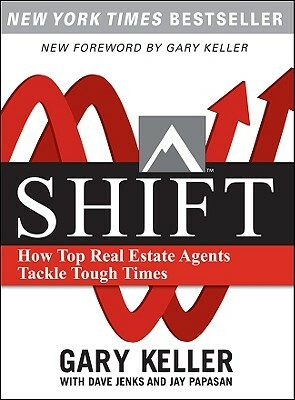 Their latest book, SHIFT, is perfect for all real estate professionals. It captures the very essence of a shifting housing market and what Realtors need to do to thrive therein. SHIFT will help you alter your focus and your actions to ensure that you get your head back in the game and increase your market share, irrespective of strong or weak market conditions. It's a great book - read it today." "Need help weathering the storm in today's real estate market? If so, reach for Gary Keller's new book, Shift-- it's the lifesaver you need today to thrive tomorrow. Shift is rich in easy-to-understand strategies, charts, and illustrations that show you exactly what you need to do to thrive in today's very challenging and 'shifted' real estate market." Gary Keller launched his sales career and later Keller Williams Realty International during two of the worst downturns in the recent history of the real estate market. With SHIFT, Gary and coauthors Dave Jenks and Jay Papasan deliver an authoritative resource for surviving and thriving in a shifted real estate market and the latest book in the bestselling Millionaire Real Estate Series.